This red backsplash uses glass mosaic tile between cabinets like paint — from counters to ceiling. It’s rare to find the color red is used in a bold way to create a visual theme for a contemporary kitchen with no red cabinets. 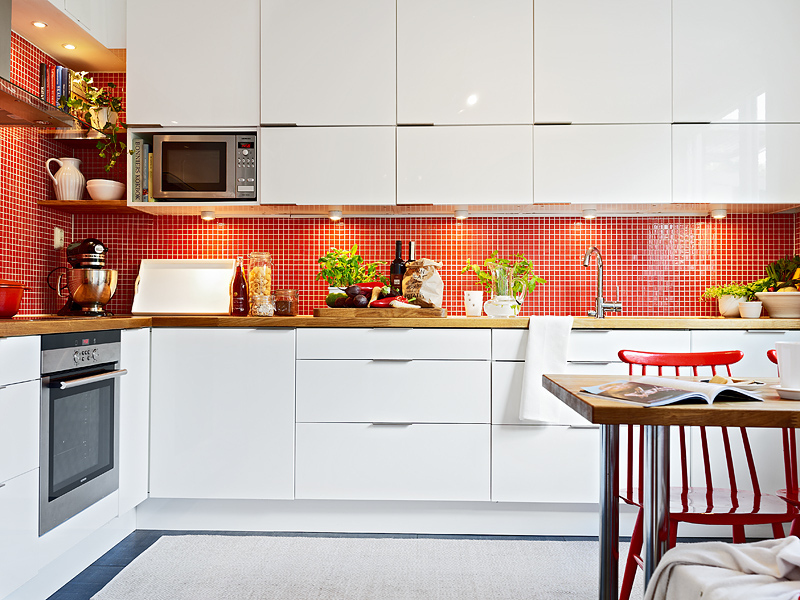 But the red backsplash in this Swedish apartment kitchen shows us how to do it impeccably. Essentially, this is a contemporary white L-shape kitchen, with white walls and white minimalist cabinets. So it’s logical to have red glass mosaic tile fill all the space between cabinets on both walls — like paint. I call this of counter-to-ceiling tile treatment a “eurosplash” because it’s the way European kitchens are usually tiled. That’s in contrast to kitchen backsplash style in the U.S. where too often tile often stops in odd places, clashes with the granite counter, or is chosen as an afterthought rather than in the overall design. The surface scheme for this kitchen has 3 elements: white cabinets, wood counters and red tile. The cabinet color blends into the white paint and trim on exposed walls. Counters blend into the tile, which is set with white grout. I find the effect to be as charming as gingham fabric. There’s a large window on one end of the kitchen which adds abundant natural light. Red-painted dowel-back wood chairs — so Swedish! —keep the color scheme consistent and lively. The sink wall has a great layout with ample space on each side for setting down. Notice drawers in the sink cabinet? I’m intrigued by those and wonder if they are the cut-out type I found in my Kitchen Cabinet Pull Out Ideas post. They look quite similar. Because this kitchen is relatively compact, the upper cabinet space has been cleverly doubled. There’s a row of short European-style upper cabinets for frequently used items and a row of taller cabinets above. Puck lights below the upper cabinets provide excellent illumination. A microwave cubby at the end of the run positions it well and creates an almost built-in look. An awkward corner is filled in wood wood shelves for display. The floor in this kitchen is actually very dark but it’s covered up by a low pile rug that reads as white. Dark floors absorb a great deal of light and here, the object clearly is to keep things as bright as possible — a good strategy given the short winter days in northern Europe. The range wall is my favorite because it’s so clean! The backsplash runs full height behind the chimney hood. There are no cabinets crammed in here to interfere with the sculptural hood style — which is one reason to buy one of these. An induction cooktop has a low profile which helps it blend into the counter. The electric oven is well placed in this kitchen below the cooktop so the hood can do double-duty if necessary. The Liebherr fridge — with it’s iconic handles on the end of the cabinet run is made to look built in. Quite likely it’s a slide-in but the way the doors are engineered allows it to work in very tight places. The Liebherr in my remodeled apartment kitchen, detailed in My Old New Kitchen post, was installed just the same way. Odd spaces above, and to the left, of the refrigerator are also cleverly planned. This isn’t a budget kitchen but it’s not a super costly one either. It is intelligently and cleverly conceived, planned and installed and offers a modest but excellent example to anyone thinking about redoing a kitchen of modest size. 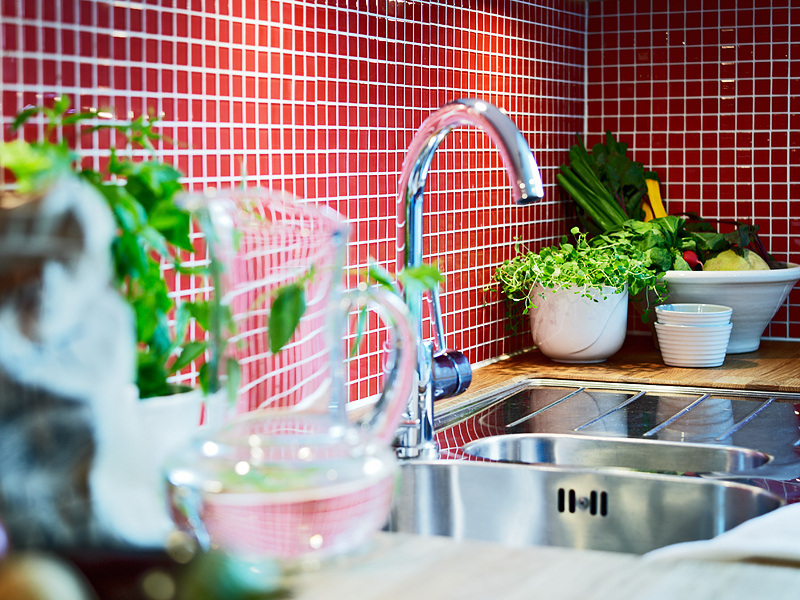 I love red, and you have the perfect back splash! 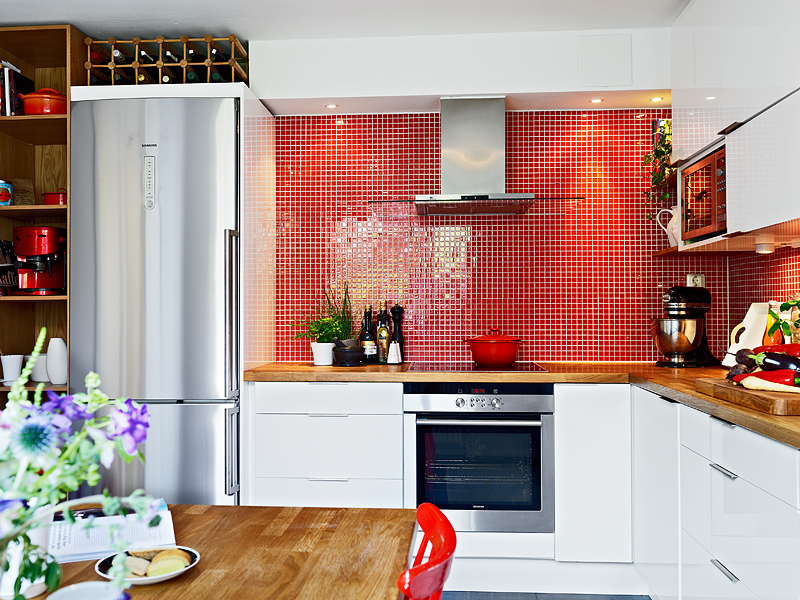 Red kitchens are very cheerful and fun. I love everything about this kitchen, and I am saving this post for future reference. Thanks for sharing!